With Brightly Painted One, New Zealand’s Tiny Ruins crafts an album of devastatingly delicate beauty. 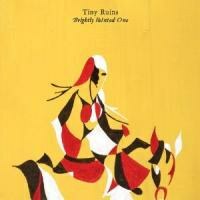 Originally conceived as a solo project for New Zealander Hollie Fullbrook, Tiny Ruins has, with their second album (first for Flying Nun), become a band proper, with Cass Basil and Alexander Freer joining on bass and drums, respectively. Continuing on with the stylistic template laid out on 2012’s lovely, minimalist Some Were Meant For The Sea, the addition of Basil and Freer, plus a number of other assorted horn and string players throughout, helps take the already exceptional songs of Fullbrook to glorious new heights, fleshing them out with perfectly complimentary arrangements ideally suited for late-night listening and foggy, solitary Sunday afternoons. Reminiscent of Beth Orton, Cat Power’s younger sister (with a predilection for the British folk revival of the late-1960s) and the jazzier side of Norah Jones, Fullbrook’s voice is a lovely lilting instrument capable of the subtlest phrasing and an expert ability at finding the interesting spaces between notes. She fully inhabits each for a fraction of a second, just long enough to leave a lasting impact. Her overall effortlessness of delivery, often sounding on the verge of a sigh, is the key to Brightly Painted One’s heartbreaking beauty. Thankfully, what she has to sing about is just as compelling as her faintly accented delivery. As with the best of songwriters in the folk tradition, Tiny Ruins’ Fullbrook manages to bring the characters populating these 10 gorgeously sparse tracks to life, imbuing each with a breadth and depth that leaves them fully formed in the ear of the listener, having lived very real, meaningful existences that extend beyond the brevity of the songs themselves and into some lush world that transcends its fictional origins. From the opening “Me at the Museum, You in the Wintergardens”, with its tale of young lovers scheming together on their respective lunch breaks from their titular places of employment, through to album closer “White Sheet Lightning” and its abstract poetic pointillism, Fullbrook crafts hyper-literate lyrics that artfully convey lives in miniature. Like the best short story writers, Fullbrook recognizes the importance of brevity and minimalism in crafting fully fleshed-out characters in the short time allotted, leading to maximum lasting impact. The songs, like the best stories, beg to be heard again and again. Were it not for a few haunting, ethereal atmospherics on a handful of tracks and a very contemporary immediacy to the album’s production, it would be nearly impossible to attach a specific decade, let alone a specific century, to much of what’s presented here. This timelessness and transcendence of zeitgeist-tapping musical trends works immensely in their favor, refusing to be date-stamped or tagged with the sell-by date plaguing a number of contemporary indie artists who, upon repeated listens, fail to stand the test of time. Mining a similar territory as the British folk revivalists of the late-1960s, Tiny Ruins often plays like a female Nick Drake, albeit with a slightly sunnier overall disposition, with its contemplative, delicate guitar work, subtle arrangements and poetic lyrical imagery. “Reasonable Man” and “Jamie Blue” could easily function as counterpoints to nearly anything on Five Leaves Left, with their fingerpicked guitar lines, sympathetic string arrangements and vivid, literate lyrical statements of characters grappling with their own existence. On “Jamie Blue”, vocalist Fullbrook sounds like a cross between Drake and Joni Mitchell, slipping from note to note with jazz-indebted, idiosyncratic phrasing that easily elevates Tiny Ruins above and beyond any contemporary artists mining similar sonic territory. While it has all certainly been done before, Tiny Ruins manages, like the best artists, to find the spaces previously unexplored within a well-worn genre, creating a logical extension of their musical lineage and looking forward with a well-earned sense of confidence in both their material and take on folk music. Above all, Brightly Painted One is an album of quiet, devastating beauty.